PLAY DAY! Every third Sunday in the summer months (June, July, August, and September). FUN for EVERYONE. 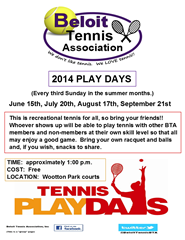 Bring your friends and family for a day of socializing and playing recreational tennis. This is recreational tennis for all, so bring your friends!! Whoever shows up will be able to play tennis with other BTA members and non-members at their own skill level so that all may enjoy a good game. Bring your own racquet and balls and, if you wish, snacks to share.